← Today’s Cheese Graduates – Take 3!! My (city girl) sister is on maternity leave. She has always wanted to make bread with her farm girl sister. The other day, she had her chance. Unfortunately for her and that frozen pink baby in the background, the Animal Whisperer and I are on a mission NOT to turn the furnace on until at least Antarctica. Our children wake up shivering. We tell them and ourselves that it will teach them to be tough. They don’t believe us, and fight over the space heater that shoots heat into the cold air and disperses about 11 inches in front of the heater. 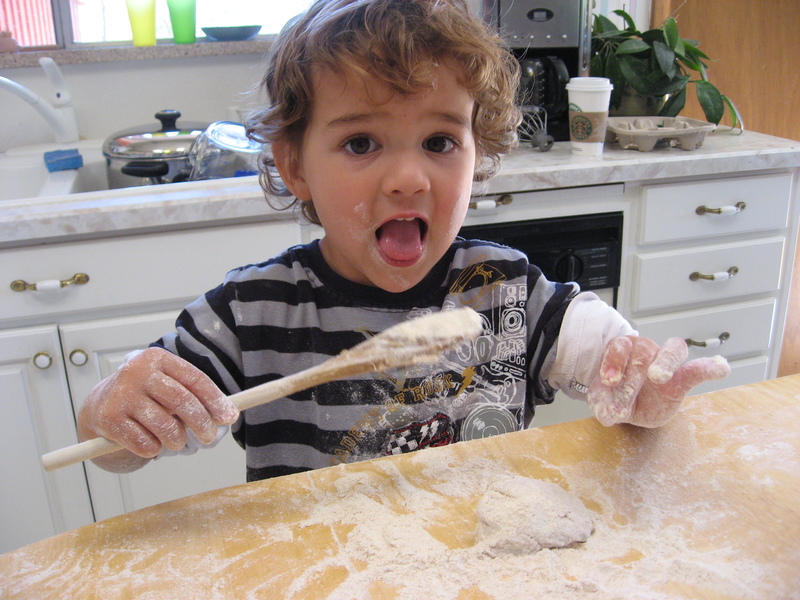 I’ve been debating, after many requests, having a bread making class. It sounds fun, and I do believe I’ll do it. She did VERY well. Check out the kneading she’s doing above. 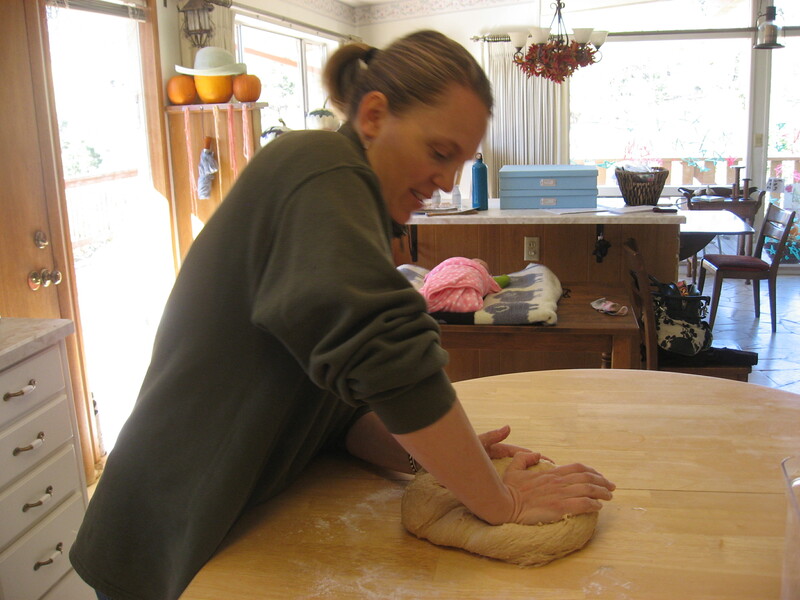 I don’t think she’d kneaded anything in her life. But, she did impressively well. Now, if this had been an official class and if I hadn’t felt sorry for her pink popsicle in the background, I would have given her an F for the class. But, I also understood. When it’s hovering around 50 inside the house, icicles start to form on those drips of boogers that dangle from the inside edge of one or both nostrils. And, as icicles go, they get longer and longer the more liquid drizzles down them and freezes. So, she had a choice to make. Wipe it off now at the risk of failing the class, or letting a potentially long icicle fall off her nose unexpectedly and embed itself irreparably in her masterfully kneaded bread dough. 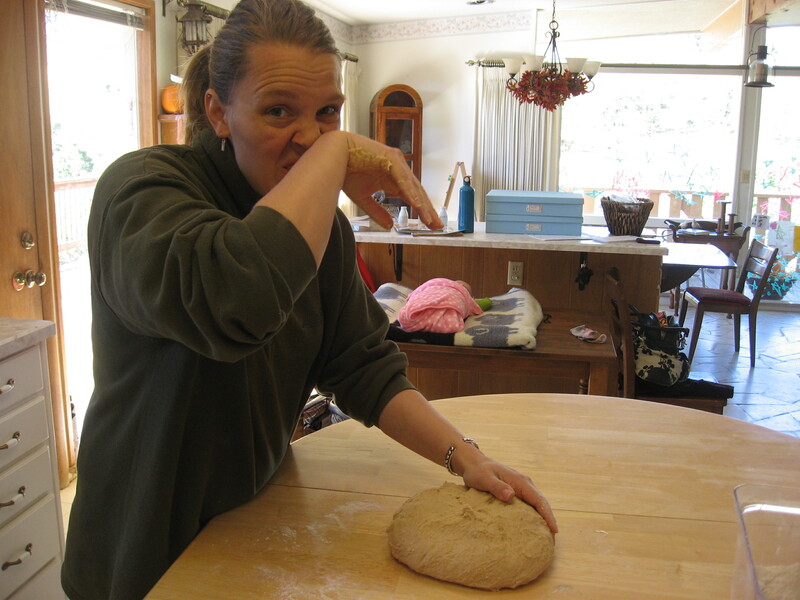 Icicle boogers can ruin a batch of bread dough. If you’re taking notes here, please underline that one. And, if I do have a bread making class, I promise to have the furnace on. I think it would be bad for business if we had multiple student’s firing boogercicles into their dough. You just can’t have someone pay to come to a class, then have them suffer the embarrassment of the boogercicle. So. It’s decided. Animal Whisperer and I will not make it to our predetermined goal of not turning the furnace on until April 3. We will give in. For the sake of all involved, we’ll turn the heat on. P.S. Another member of my sister’s bread making class. He should not have passed either, but he’s too cute to fail. This entry was posted in Bread Making, Farm Life. Bookmark the permalink.